Power Air Fryer 360 Reviews - Too Good to be True? The Emeril Lagasse Power Air Fryer 360 is an air fryer designed by celebrity chef Emeril Lagasse that can replace up to six different small appliances. It has the capability to act as a traditional air fryer, toaster, microwave, dehydrator, rotisserie, and deep fryer. It can also be used as a convection oven when cooking small to medium-large meals. The unit provides you with nine different functions in one giving you the ability to air fry, rotisserie, dehydrate, bake, roast, broil, toast, slow cook, and make pizza. There are twelve pre-set smart buttons for all of your cooking needs, but you can even set your time and temperature manually if desired. The sleek design is finished with brushed stainless-steel to match a variety of decors and will fit on most countertops. The glass door provides a large viewing area while the LCD panel shows the cooking information in an easy-to-see format. The Power AirFryer 360 comes in two different models; the standard model and the XL which is made for a larger capacity of food. Both models come with the same features and 1500 watt power, including the following bonus accessories: drip tray, pizza rack, baking pan, crisper tray, rotisserie spit, and Emeril's Power AirFryer 360 Recipe Book. You will also have access to a library of recipe videos online. The cost of Power Air Fryer 360 is $199.96 and the shipping is FREE! The inner capacity of the unit is 930 cubic inches, which should be large enough to fit a 12" round pizza or a 10 lb chicken. The unit is 19" x 15" x 9.5" - 1500 watts. Due to the more compact size of this unit, it is recommended for a single person or couples. While the exact size of the unit is not specified, it should be large enough to fit a 14" round pizza or a 15 lb chicken. The unit is 20" x 17.5" x 12" - 1500 watts. This is the XL size unit that will be large enough to feed the whole family! The length of the power cord is 3' 4" long, so make sure to place the fryer within a distance of a power outlet. It's also advisable to not allow excess cord to hang loosely in front of the fryer where children could possibly pull it. Due to the compact size of the air fryer, there is no need to spend a lot of time pre-heating your oven. It's suggested to turn it on while you prepare your meal, and then it will be ready to go. You can even put your food in straight from cold, but you may want to add an extra 3-5 minutes to the cooking time. With the Power AirFryer 360, there is no need to defrost your food before cooking. Although it is a good idea to follow the instructions on the box if you are cooking a pre-made meal. You can turn on the light to check on your food through the glass door. Alternatively, you can also remove the rotating mesh baskets at any time or flip your food on the racks to ensure even cooking. While the doors are open, the cooking cycle will pause, and resume when you've placed the food back in the fryer. Although the units do not appear to take up a lot of space on the counter, it is important to note that you will need to leave extra space in the back for the vent. If placed too close to the wall your unit's air flow may be blocked. It is not necessary to use added oil with the Power AirFryer 360 since it cooks your food with heated air. However, for added flavor, you can spray or coat your food with a bit of oil. Keep in mind, this will add calories to your meal. With the addition of five heating elements, the Power AirFryer 360 is able to achieve all over, 360-degree cooking. You won't have to worry about hot or cold spots in this oven! Drip tray - this will help eliminate extra cleaning. Rotisserie - comes with two prongs on each side to make sure your chicken or meat stays secure while cooking. Pizza rack - designed to cook your pizza evenly on the top and bottom. Baking pan - the perfect size to fit in your Power AirFryer 360. Crisper tray - to crisp up onion rings, french fries, chicken strips, and more. Your Power AirFryer 360 has a memory feature that will remember your last pre-set and temperature for added convenience. Customized toasting using the pre-set function, you can toast bagels and bread without needing to flip them. You can choose from one of five levels of doneness (light to dark) and are able to fit six slices of bread in at a time. You have sixty days to receive a replacement unit or return the product if you are unhappy with it. When returning, you will be charged an unspecified processing and handling fee, and be responsible for the cost of shipping the item back. With the purchase of either unit, you will have access to an online recipe video library. Additionally, as a bonus feature, you will also get Emeril's Power AirFryer 360 Recipe Book. Both units come with twelve pre-set smart buttons to make cooking even easier! Airfry - to achieve maximum frying capability. Roast - cook the perfect roast chicken, beef, vegetables, and other meals. Bake - create delicious cakes, breads, and cookies. Slow cook - a great option for soups and stews. Rotisserie - for the most delicious and juicy rotisserie chicken and other meats. Broil - melt cheese on top of a meal or give that beautiful browned finish to any dish. Reheat - evenly warm up already made meals. Warm - keep dishes warm with this selection. Toast - replace your toasted with this one appliance. Bagel - perfectly toast all sides of your bagel in this machine. Dehydrate - an excellent feature to create your own dried fruits and jerky. Pizza - your homemade pizza will taste like it was delivery. The all-in-one Power AirFryer 360 will save you money by replacing up to six different appliances, so you will no longer need to buy, repair, or replace them. You'll also be using a fraction of the energy of a standard convection oven, saving you money on your electricity bill. Before cleaning the Power AirFryer 360 it is important to unplug the machine and make sure it has cooled completely. This will prevent you from inadvertently burning yourself during the cleaning process. Start off by removing the dishwasher-safe accessories. Clean the inner wall and heating element using a small amount of nonabrasive soap and a nonmetallic sponge. Finish off by wiping off the glass door. You may then place the dishwasher-safe accessories in your dishwasher for easy cleaning. If needed, you can also wash them by hand using the same nonabrasive soap and nonmetallic sponge. Due to the capacity, this until will not be suitable for very large families or gatherings. It does replace your convection oven in certain situations, but not when you're required to cook large quantities of multiple items at once or birds larger than 15 lbs. The official website contradicts the size of the units (www.powerairfryer360.com). On the main page, it says the capacity of the Power AirFryer 360 XL is 930 cubic inches, while on the FAQ page it says the Power AirFryer 360 has that capacity. Both units cannot have the same capacity as the XL model is larger. The Power AirFryer 360 & 360 XL can replace up to six appliances in your household! This not only saves you money but also saves room in your kitchen and on your countertop. You won't have any more need for a traditional air fryer, dehydrator, microwave, deep fryer, toaster, or rotisserie. You'll be using your convection oven much less often, saving you time from pre-heating. This is the most versatile small appliance that you'll have in your household. All accessories are dishwasher safe making cleaning quick and easy! Emeril Lagasse is a well-known chef, restaurateur, television personality, author and philanthropist. You can trust that he has used his knowledge and experience to create an appliance that he believes in. When creating the Power AirFryer 360 he took what he thought to be the best features of his commercial kitchens and made them accessible to families at home. Blooming onion: Power AirFryer 360 - 380 calories vs deep fryer - 1950 calories. Chicken fingers: Power AirFryer 360 - 250 calories vs deep fryer - 780 calories. French fries: Power AirFryer 360 - 70 calories vs deep fryer - 340 calories. With the Power AirFryer 360's Quick Cook Turbo Heat Technology, you're able to save time while enjoying a delicious meal! You can roast a turkey up to 40% faster and save thirty minutes cooking a chicken versus using a traditional oven. Steak and fries can be ready to eat within twenty minutes and pizza can be crisp in minutes. Even better, hours of defrosting time will be eliminated since you can place your frozen food directly into the unit. The use of multiple racks means that you can cook up to 450% more food than traditional air fryers! Do not buy Power Air Fryer 360 online before searching Amazon. Over Priced $225.00 EMERIL SPIT - TOON! Does NOT replace any microwave. (Not sure where this came from anyway). Performs well. I bought the accessory kit. Cooks most things nicely & quickly, HOWEVER: - Spit is just plain stupid! Cheaply made RUBBISH! Possibly I received a bad one, but my spit does NOT "rotate" it just "tumbles" around at its own pace due to so much free play in mechanism! BADLY designed (in China, naturally) & not a patch of our old New Wave oven which has a far better gearing mechanism. I will never use the spit again. Supposedly "designed" by Emeril LaGasse. What BS! The only thing he did is imprint his logo on this Chinese made joke & make a fast $100.00 out of every sale! His TV ads. Are also exaggerated & Deceiving. What happens to the ones returned? I suspect they are cleaned up, re-packed & shipped out as "NEW" once again! Think twice before purchasing this oven. I chose this oven because of it's larger size and multi-functions. Despite instructions, it takes a bit to get used to. I first tried making coconut shrimp from raw dipped ones I put together and they turned out good. Next, I tried using the rotisserie function for a 4 lb chicken I had brined overnight and then seasoned. Despite adequately tying up the chicken and following spit insertion instructions things did not go well. After a half an hour of trying to center the spit and inserting the tines into the chicken which do not easily enter the spit I got it together with thumbscrews hand tight. Because of this, I had second thoughts about the purchase. I cooked it at 350 for 55 minutes and 30 minutes into cooking the thumbscrews loosened up shifting the chicken to the right. I checked it's temp at the end and it was only 155 so I added an additional 3+ minutes cooking time. Getting the chicken out of the oven was very difficult as the left power side did not want to dislodge. The positive thing is the chicken turned out very juicy and tasty and a lot of rendered grease was captured by the drip pan. I think the other features will work okay, but I give it a thumbs down on the rotisserie at this point. In the commercial, it states microwave function. It does not have it. I called and was told reheat was the microwave, it is not. Reheat heats the oven. False information. Thanx Shirley, I caught the same thing. They mislead people about the microwave function. When I asked on FB, they said it would "Replace" a microwave. Either wave, they are misleading people. It makes me wonder what else they are dishonest about. How hot does the air fryer get on the out side is it safe or what? I have to shove my frier basket several times hard before it will come on. I believe something is wrong with it and need to get some help. I think I would love it if I could get it to turn on when I put the basket in. I think the basket may not fit correctly. What can I do about this? Ordered my air fryer back in February. Arrived very quickly. However, was shipped shortly the rotisserie spit and stand. Called customer service for a replacement, they said yes no problem will ship quickly today. Here we are 6 weeks later, still, no rotisserie called again, and they can't provide the item. They finally explained it's been backorder the whole time from day one. Not a good idea to ship short and not inform the customer upfront. I'm shipping back for a refund. Nothing but a glorified toaster oven anyway. Just visited the website, emerilairfryer360.com. Nowhere does it claim to be a microwave. There's an accessory page to order the cookbook and additional trays. Emeril's name is on the product. My only concern right now is the review that mentioned how hot the exterior of the unit is. It's just two of us! I love it so far! Still learning how and times! But it's great! Thank you. Question: exactly how hot does the metal case become when using this oven over an period of time? Thank you. Need a bigger cookbook with more than 20 recipes or access to one free on the internet, rotisserie chicken was excellent but only 4/5 lbs, could not do a 12 lb as advertised. The 12lb bird was a turkey. Chickens don't grow that big. Well you need to use the cooking tray to cook your 12 lb. Bird. If you go to this site you can get a digital. Copy of the 48 page cook book. https://www.tristarcares.com/product-power-airfryer-360.php. Can you put metal in his air fryer (microwave Use). I'm not sure what's going on with this product but I just called emril's store direct at emerilstore.com Customer service 829 st. Charles ave. New orleans, la 70130 800-980-8474 Email: info@emerilstore.com The lady whom answered the phone there said she was told to tell anyone calling about this product to tell them to not buy it From this # on the website call toll free 1-800-586-0705 the lady was a b#$%& when I called to ask questions concerning warranty. Beware! I was also just going to order one, now I am SO glad I did not! I usually research everything to death and become paralyzed as to what to do. I've come to the conclusion that the more claims made for the product the less functional it really is (or only works for a short amount of time). Bet it was made in China (everything is now, how can we avoid it?) Reading over the lack of response to questions about problems, it sounds like one big SCAM. Just have to admit that maybe, just MAYBE, the old ways are best! Think you might want to read my review on this EMERIL La Gasse air fryer. It will be up tomorrow. Thanks. A 90-day warranty? Really? I can just about guarantee you that something will go wrong. I've read two dozen comments that all spoke of flaws in the construction or of the less-than-stellar material/workmanship. I have a Breville that conked out after a couple of years and it is a lot better product than this is. Fair warning. These reviews were VERY helpful; almost spent my last dime to buy this. On Social Security & post hip/heart surgery, so I appreciate all of you. What kind of cookware can I use on the reheat setting? I just received the power airfryer 360. How do you use it as a microwave? It took me 45 minutes to cook a potato. I'm just learning so hope it gets better. Should the airfryer get so hot that it will burn you? The cabinet under it was so hot you couldn't touch it. My hubby has Alzheimer's and he burned his hand touching it. If it gets this hot all the time I will have to return it. I did not receive a cookbook. What should I do? I too found it cooking a potato too long. I may be sending it back. Thanks. Negative Reviews - Pros and Cons! It seems, by the number of dissatisfied customers that either this item or the provider does not live up to its promises. I read microwaves are lethal to your health so I Decided for an oven to replace it through the only thong this oven can't do is boiling water. As far as price, it seems a little too high in comparison to Amazon's but the TV commercial offers partial payments which could be an attraction concerning money. I saw the 360 air fryer replaces a microwave, but no where in the instructions does it say how to use the microwave. Can you let me know how to use it? 19 of 27 people found this review helpful. Reheat in an oven safe pan. It is false. Or deceptive advertising it does no of what it says mine is on the way back. Had a problem, terrible customer service. Do not order this product! 21 of 23 people found this review helpful. I just bought a Power Air Fryer Oven 360. I don't know how to use it. There was no book to explain & no recipe book in the box. Please send me books so I can cook in my new Oven. You can get a digital copy of the 48 page cook book at this site. https://www.tristarcares.com/product-power-airfryer-360.php. I bought the Power Air Fryer 360 oven. Are there any other recipes that you can use besides the ones in the book that came with it? Yes, there are several I'd cookbooks out there. Some are labeled air fryer, some air fryer oven. All will work with oven. You can also Google air fryer recipes. 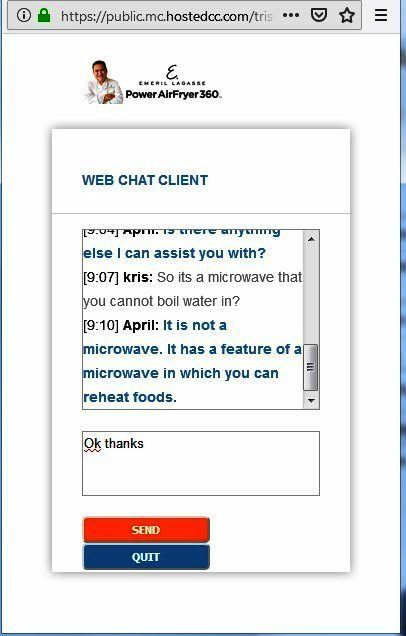 See chat - not a true microwave. 17 of 23 people found this review helpful. Model nymbers don't March up either can't get ahold of anyone to find out. 18 of 21 people found this review helpful. Can I purchase an additional crisper basket? I recently purchased the air fryer from the website that was advertised on TV. The air fryer doesn't have the Emeril name on it as advertised. I contacted the company twice, the first time they disconnected me, but I didn't give up trying to get an answer. After 1/2 hour I was told they would contact me via phone or email. I still haven't heard anything which is why I wanted you to know my dissatisfaction. I could have purchased the same air fryer in the store for $158.00. I was charged $248.00 which I was ok with because you sponsored the product. Needless to say, I am very dissatisfied with the entire experience. I plan on contacting the Better business bureau so that others don't have the same sad experience I encountered. 96 of 100 people found this review helpful. Thank You I was just getting ready to buy this but NOT NOW! Thank you for the review. I decided not to buy this. So what do you buy? I was thinking of the one advertised on QVC. Thank you for your comments. I was getting ready to purchase this but Decided to review any complaints first. You saved me my precious dollars! Wow I am soooo glad I read these reviews. Not too encouraging and btw I found another “As on TV” ad for an appliance that could be its twin selling from the company that sells the copper pans! The photos they had were IDENTICAL to the ones on the Emeril ad. Guess if they don’t get you one place they’ll get you at another! Ordered ours for Xmas. Didn't arrive. Were told the end of January delivery. Didn't come. Told now maybe end of March. Canceled order. Went to Sam's Club and bought one! 35 of 38 people found this review helpful. Hello, so, SAMS club sells the same model? I don't care if the name of Emeril is on or not, as long it works as they advertise it:) thanks! It does not work as advertised the rotisserie is very hard to work. It does not replace a microwave, can only be used to reheat in three times as long and in oven-safe pan, because of the high outside temperature it must be kept at least 5 inches [back and side ] from a wall and not to be used sitting under cabinets most foods not completely cooked with preset times you I have only been able to cook one thing at a time. The only thing it does well is cook biscuits. But my $40 toaster oven does that. Mine is on the way back. Pretty expensive for something made in China. Sam's club sells it online for $159, Kohls has it for $219. Check prices and return pol I did before buying anywhere. There are 2 models, one for one or two people, or the xl that's supposed to feed a family. Check reviews online. My husband ordered this for me for XMAS, and it was on back order. Just came yesterday! The book WAS in the box. I have made 4 different things already today and they are all great. We rotisseried a chicken and the skin as so crisp and amazing. I'm happy so far! You give it 5 stars but then say you regret buying it? She did not say she regretted it. The only issue she said she had was that it was on back order before she received it. What type of cook wear do I need to use? Never use metal cookware on non-stick surfaces. An Apron would be fine. I bought this XL oven type Power Air Fryer 360 yesterday, I opened the box this morning, it had plastic still on it which showed it hadn't been opened, which is good! However, the book was not in it! I'm not going to run back and forth in my wheelchair to try to read every detail about this product when it's supposed to have a book in it to explain it to me! Please send me a book ASAP! If you'll email me, I'll send you my address so I can receive this book! If you don't acknowledge this Q by email, I'll return this to the store I purchased it from and get almost $200 bk and buy a cheaper version of another product for $59.00! Don't mean to sound so harsh, but I was all excited to get this and then to find out I don't have the book in here it's kind of a letdown right from the start! Thank you. There was no book in mine either. Did you get a response? You can get a digital copy of the cook book here https://www.tristarcares.com/product-power-airfryer-360.php. I ordered mine Dec. 16, 2018 and was also told it is on back order. Today I was told possibly Feb. 18th. The charge was removed from my credit card as well. Very strange. I wonder if Emeril knows what the problem might be. This happens all the time with these TV Promotions. It happened with the NuWave induction cook tops that had a bit one get one free deal going. They were back ordered then I got one which I returned, 2 years later I got a call from a collection company telling me I owed for one unit. But from a brick and mortar store so you know where to go it there's a problem. Maybe Santa Claus or the Easter Bunny will help you. Next time I see the Tooth Fairy I will ask her to get in touch with them for you. I wish you good luck in your endeavor. I am so surprised that not one recipe came with this machine. I want to return this unit. I have ordered the 360xl but I keep getting the out of stock when I check the customer status. When is this product going to be available? I emailed Power Air Fryer and they are telling me there isn't an XL one. That explains why I can't figure out where to order one I think. If you find one, please let me know. I just got off the phone with the Correct Co. They clearly Do Not have a XL system. I was on the phone with them for well over 45min. Looking into any and all information regarding this Machine in whole. I did order mine right from Power Air Fryer 360 @ the website powerairfryer360. Com or on the phone @ 1-800-316-4596. I was able to get this machine for $149.96 w/a 6yr warranty for a total of $195.71. I hope this helps all who are looking to get this machine. Were did you purchase the 360XL? Is it the same Oven as seen on Emeril's ad only bigger? I can not find any supplier that has availability. Hi I just ordered the 360xl and inquired about its size. They said the 360xl is 1800 watts with 1400ci. The regular 360 is 1500 watts with 930ci. Hope this helps. I am interested in purchasing the 360XL, but have one question if you would be so kind as to measure the length of the rotisserie rod from tip to tip, and describe and/or photo the two ends. 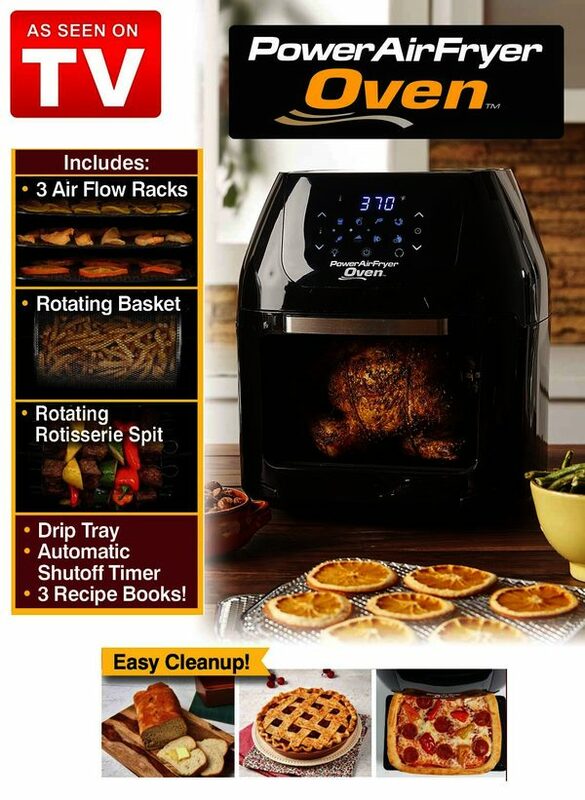 What I want to do is buy one of the wire rotisserie baskets that come with the Power Air Fryer Ovens, as this isn't an optional accessory to this Power Air Fryer 360xl, and is the ONLY thing holding me back from buying one. Thank you in advance. This would be for a Christmas gift THIS YEAR, so if you could reply by email to the above address ASAP, it would be most appreciated. Thank you! I can't figure out where to order the XL one? I talked to Power Air Fryer and they told me only the 360 is available and that there's not a larger one. Help! Yes. I emailed the company and they tell me they only have one size. I'm wondering if it's a different brand people are getting? It's strange because on their website it says there's 2 different sizes. One will hold a 12" pizza and one holds a 14" pizza. Where did you order the 360XL? I can only find the 360. Thanks. I ordered mine on Amazon. Please advise were you purchased the 360XL? Is it the same Oven as seen on Emeril's show only larger? Thanks. How can I upgrade to the larger XL model. There is some question about capacity with 930 cui. What is ate actual xl model cui?